You'll be £45.00 closer to your next £10.00 credit when you purchase British Battleships of World War One. What's this? This superb reference book achieved the status of 'classic' soon after its first publication in 1986; it was soon out of print and is now one of the most sought-after naval reference books on the secondhand market. It presents, in one superb volume, the complete technical history of British capital ship design and construction during the dreadnought era. One hundred years ago at Jutland, Dogger Bank, Heligoland Bight and the first battle for the Falklands, might squadrons of these great armoured ships fought their German counterparts for command of the seas. Beginning with Dreadnought, the book continues to the end of the First World War, and all of the fifty dreadnoughts, 'super-dreadnoughts' and battlecruisers that served the Royal Navy during this era are described and superbly illustrated with photographs and line drawings. Each class of ship is described in detail so that design origins, and technical and operational factors, are discussed alongside characteristics, with special emphasis on armament, armour and machinery. Fully detailed data tables are included for every class, and more than 500 photographs and line drawings illustrate the text. A delight for the historian, enthusiast and ship modeller, it is a volume that is already regarded as an essential reference work for this most significant era in naval history and ship design. An impressive work with Brutal documentation. Very interesting for those lovers of naval history of all time and who like stories based on real events. Essential for Naval Modelling and Historians. Revised edition of an excellent and detailed reference work. This magnificent reference book achieved the status of 'classic' soon after publication in 1986. This revised edition presents the complete technical history of British capital ship design and construction during the dreadnought era. A new edition of a book described by many as a modern classic. Meticulous detail... supported by a fantastic selection of photos... and some marvellous quotes. An extraordinary piece of intricate research covering a specific area. The author has produced an irreplaceable reference work. this is particularly true for the detailed descriptions of each vessel's armour layout. Burt's British Battleships of World War One has a much narrower focus both temporally and contextually. As a reference work he has produced a volume that is destined to be the standard for the subject. Rated as one of the best reference books available. First rate work 10/10. The text is supported by more than 350 well-chosen, high-quality photographs as well as excellent line drawings and figures. The end result is a magnificent work that will be of value to the historian, warship enthusiast and ship modeller. In my opinion this is the definitive reference work for British battleships of First World War, and, as such, should be essential reading. Very highly recommended. This magnificent 344-page book is crammed with informative text, illustrations, line drawings and contemporary photos that cover the history of British capital ship design and construction during the ‘Dreadnought Era’. The book will no doubt appeal to historians and ship enthusiasts, but will be of equal value to ship modellers interested too. More than twenty types of battleship are described in detail, including the well-known names such as the Dreadnought, King George V, Iron Duke and Royal Sovereign Classes of ship. Each chapter includes a superb selection of archive photographs, line drawings, specifications and statistics regarding the service history of the type in question, which provide a comprehensive and informative history of each class of ship in what many would regard as the hey day of battleship design. In some cases colour side profile illustrations are also provided to show some of the more outlandish camouflage schemes to have been adopted at the time, all of which helps to round off this magnificent book and guarantees that it will be seen as a valuable resource for historians and model makers alike in years to come. Burt’s works bring together a powerful combination of extensive photography, detailed large scale drawings, diagrams illustrating differences within classes, changes over time, and camouflage schemes, and lucid text describing development, realization, modifications and upgrades, service history, and analysis of the successes and failings of the various classes technologically, operationally, and in comparison with their foreign contemporaries. The overall high quality of the volumes’ presentation, especially of the lavish imagery, adds to the sense of their completeness. The most remarkable accomplishment of Burt’s volumes is their success in bringing together policy, technology, evolution to face new challenges, physical changes, and operational history, accompanied by extraordinary and extensive imagery. They simultaneously meet many of the needs of historians of technology, researchers in naval history, and model makers without compromising the quality of the work. The publishers are to be congratulated on bringing these important work back into print – they fill a major need. I have to start out by saying that it is a magnificent book: It is in hardcover, printed in a large format on high quality paper, and has over 350 stunning pages with many beautiful and interesting photographs and design drawings. It the kind of book people who love book – just find very attractive and cherish owning. That said, this is also a great treat from a content point of view. R. A. Burt has researched the design, construction and service histories of British battleships for many years, and has an outstanding collection of photographs of these ships. Burt is an extremely accomplished draftsman and illustrator, who lives in England. In this book, he shares amazing photos from his exhaustive collection. Along with the complete technical history of British capital ship design and construction during the era that is often referred to as the dreadnought era – back when the biggest ships were also the most powerful ships. The text is well researched and well written and full of interesting and intriguing detail. It is a marvellous collection of information. There are also some comparisons to foreign ships and some quite interesting analyses that shed light on the issue of the relative strengths of the various Navies in WW1. 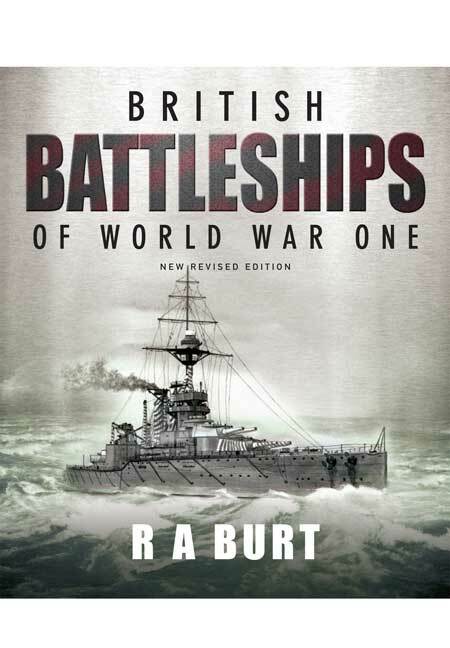 British Battleships of World War One is a great book to read stunning to look at, and at a magnificent book to own. The Dreadnought capital ships up to the Courageous – class – their history, detailed technical background, many fine line drawing and photographs. This book is destined to become one o the primary reference works on the capital ships of the British Fleet during World War 1. It has a relatively short introduction and then the real work of merit starts. The author has listed all the classes of British battleships and then gives each of them expert attention. This highly detailed research effort has yielded an outstanding reference volume. It is specialised and is a very useful addition to any naval library – especially those dealing with naval issues and actions of the Great War. The classes and the constituent ships have been painstakingly considered and have been given proficient treatment. This volume serves as an excellent source of date on the battleships of the period from just prior to and just after World War 1. Obviously many of the battleships listed were laid-down before the commencement of hostilities and many of the ship alsp served after the Armistice. Any serious student or research of British naval history of the Great War period should ensure that they either have a copy of this book or access to it. If you need to know the technical specifications of British Battleships or an outline of their service then this is the book to use. I cannot praise too highly the merits of this work and the produce of the author’s research skills are excellent. RAY BURT has researched the design, construction and service histories of British battleships for many years, and has also assembled one of the most outstanding collections that exists of photographs of the ships. He is also an accomplished draughtsman and illustrator, and many of his superb drawings appear in this book.